Look up in the sky, and consider for a moment that everyone living today thinks about what’s up there much differently than people just a century ago. The years between have brought us manned flight, satellites, moon landings, Mars rovers, the Hubble Space Telescope, and more. With a greater understanding of where we stand in space, and—thanks to Charles Darwin—a greater understanding of where we, as a species, stand in time, we’ve also gained a flood of new hopes and new anxieties. For every question that’s been answered, an old comfort has disappeared. And some big questions remain unanswerable, simply taking on new forms as science has deepened our understanding of how the universe works: Where are we going? Where have we been? In this span of time, science fiction became one way of discussing those questions. The genre’s rise alongside advances in science and technology is anything but coincidental; science fiction first flourished in the early 20th century, making its way from the work of H.G. Wells and Jules Verne into pulp magazines, radio shows, comic books, and films. 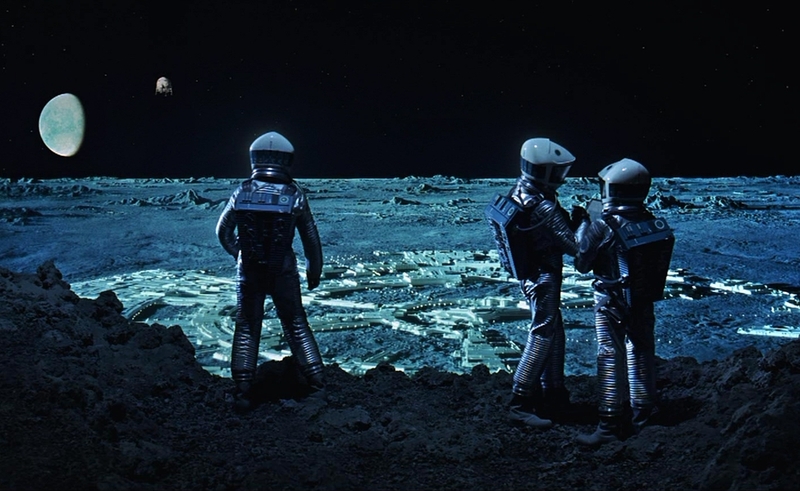 Pioneering fantasy filmmaker Georges Méliès sent a crew to the moon, and the movies have never stopped making variations on that trip. Some eras of science-fiction moviemaking are richer than others, however, and this column will examine a particularly rich stretch of filmmaking, ushered in in the late 1960s with the twin successes of Planet Of The Apes and 2001: A Space Odyssey, and shown out by the mid-1980s, when the poor financial performance of films like Blade Runner, Tron, The Thing, and Dune marked the end of a period rich with idea-driven science fiction. Yes, there have been great science-fiction films made since. And the sorts of science-fiction films that immediately followed what I’m calling The Laser Age—which tended either to be sentimental efforts inspired by E.T. The Extra-Terrestrial or action hybrids inspired by The Terminator—were often great as well. They just belong to a different time. The time I want to talk about begins with a man recording bitter thoughts about humanity as he floats through space toward another world, and with a group of primates touching a black monolith. Both actions send individuals on journeys previously beyond their imagination. The film takes him on a long journey toward recovering his pride in humanity, only to whisk that away from him in its famous final moments. After discovering a group of mute humans living in primitive conditions, Taylor is captured and imprisoned by a group of intelligent, gun-toting apes. Made mute by an injury, Taylor struggles to make his intelligence known, only to discover that—apart from the scientifically curious couple of Cornelius (Roddy McDowall) and Zira (Kim Hunter)—no one wants to entertain the idea of an intelligent human. Such a creature is too challenging to their core beliefs, which hold humans to be inferior to apes, just as they always have been. The strongest objections come from Dr. Zaius (Maurice Evans), an elder in the orangutan ruling class determined to suppress the possibility of an intelligent human, no matter how strongly Taylor insists on humanity’s superiority. For all their flaws, he says, humans never stopped pushing forward, never let their culture fall into the paralysis that grips the culture of the apes. After all, humankind sent him to the stars. Here’s one of the reasons Planet Of The Apes rewards repeat viewings (apart from the pleasure of seeing all those talking apes) after its gut-punch final shot has been revealed: It’s ultimately on neither Taylor nor Zaius’ side. Based on a 1963 novel by French author Pierre Boulle, the film’s screenplay is the product of two writers with complementary sensibilities: Rod Serling and Michael Wilson. Though the final script is largely Wilson’s, Serling—a household name thanks to The Twilight Zone, and no stranger to using science fiction to comment on the world around him—contributed the famous final twist, revealing that Taylor has landed not in some faraway land, but on an Earth where simians have taken humans’ place in the wake of a nuclear war. “Neither Abrahams nor Jacobs,” Greene notes, “knew what Davis was talking about.” Others, both behind the camera and in the audience, did know, however. Writing for the New York Times, Renata Adler opened her otherwise snooty review by calling it “an anti-war film and a science-fiction liberal tract.” In a kinder notice, Variety called it “a political-sociological allegory.” Even if few were saying it was about race, the parallels weren’t hard to miss—and the film’s sequels drew them in even bolder strokes. Besides, it wasn’t just about race. Planet Of The Apes didn’t try to hide its attempts to hold a mirror up to a society troubled by injustice and inequality, and seemingly on the verge of some tremendous change. While the grown-ups who made the movie didn’t always seem to know what they were doing, the kids got it. “There was even a line in front of the theater Friday morning,” Roger Ebert noted in his review when the film made it to Chicago. “And that’s a sight you don’t see every day.” Raised on The Twilight Zone and Star Trek, a generation arrived in the theater primed for a big-screen experience with those shows’ mix of excitement, thoughtfulness, and weird creatures. Planet Of The Apes provided it, satisfying the thrill-seekers and sending them away by asking some big questions and demanding viewers consider their answers well. It concludes with a bold bummer of an ending. But it was also the start of something new. Anyone wandering from Planet Of The Apes into a double feature with 2001: A Space Odyssey could be forgiven a sense of déjà vu. Here we are again on another planet, spending time with other apes. Or, more accurately, ape-like hominids soon to experience the first glimmers of human intelligence. Instead of a scene from the end of humanity, we’ve looped back to its beginning, where the sudden appearance of a black monolith will open the synapses of one tribe of those hominids. Suddenly gifted with the ability to make previously unthought-of connections, one turns a bone into a weapon, killing first a tapir for food, then a member of a rival tribe, before tossing the bone into the air in triumph. From there, the film famously cuts from the distant past to what was then the near-future, the year 2001. Let’s cut a little further into the future, to the end of the film, after the trip to the space station, then to the moonbase, then to Jupiter and, in the words of the film, “beyond the infinite.” Let’s cut to the end, when astronaut Dave Bowman (Keir Dullea) has journeyed to another monolith, landing in an elegant hotel room where he ages, dies, and is reborn as a cosmic child, staring peacefully at Earth, then the audience. The image suggests we’ve witnessed the opening to a new chapter in the history of humanity, one parallel to the awakening of the film’s opening moments, but whose next step lies beyond the scope of the film—a hopeful ending that stands in stark contrast to the doomed fatalism of Planet Of The Apes. Maybe. But consider this: 2001 is also a story of a species—ours—defined from its earliest moments by its capacity to kill using technology. In the film’s 2001, technology has advanced to the point where it can eradicate humanity. While it’s no Dr. Strangelove, vestiges of old hostilities remain in the civil-but-tense conversation between Dr. Heywood Floyd (William Sylvester) and some Russian scientists, suggesting that Earth enjoys a fragile peace at best. (In 2001’s original conception, the satellite in the bone-to-satellite moment was explicitly an orbiting nuclear weapon. In the final version, it’s left ambiguous.) Other 20th-century problems are conspicuous by their absence. “There are no Negroes in this vision of America’s space program,” Penelope Gilliatt noted in her New Yorker review. (She might have added “or anywhere,” which can’t be said of Planet Of The Apes.) Then there’s HAL, the supercomputer turned murderous adversary that’s a reversal of the bone weaponry in the film’s opening: As humanity evolved to use tools as weaponry, the tools evolved to the point where they could turn on their creators. 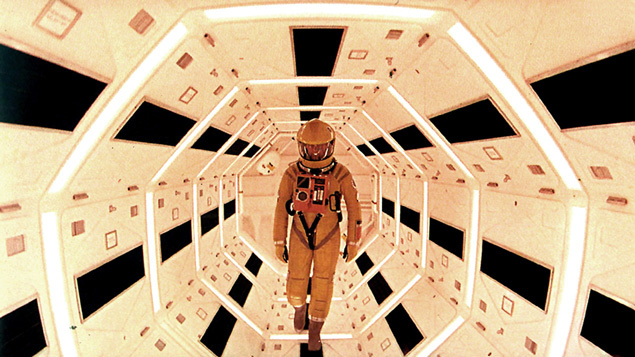 Working closely with science-fiction writer Arthur C. Clarke, director Stanley Kubrick grounded the film’s hardware in real-world physics and the best speculation as to what it would take to get from here to there when “here to there” meant plunging into the void of outer space. This was new, far removed from Flash Gordon’s space-opera fantasies, or the studio-bound adventures of 1950s cheapies. Yet all the hard science wired into the film—released a year before hard science took us to the moon—gave the film an extra charge: the thrill of plausibility. Kubrick invests every sequence of the film with a sense of wonder, but the wonder sometimes provides an ironic counterpoint to the action. Kubrick’s imagery is so arresting, and the Strauss waltz throughout the space-station sequences is so lovely, it’s easy to overlook the boredom of those making the journey. They sleep, gossip, or watch television while stunning images of the Earth and the stars pass by their windows. To viewers, it’s a glimpse at a possible future. To the characters, it’s just another day on the job. For the crew of the Jupiter-bound Discovery One, tedium has edged into drudgery as they perform the few tasks needed to keep the ship operational on its long voyage, then wonder what to do with themselves the rest of the time. The awe of watching them go about their business is far removed from the emotions of those getting the business done. Is it also possible to project hopefulness onto the ending? The alien intelligence responsible for the monolith gave humanity the capacity to think, but also pointed it down a bloody path. The glowing child could signal an end to the hostility that began in the Dawn Of Man sequence, but what if it signals something worse? So many people have viewed the ending optimistically, which says something about our nature as a species—a subject at the heart of Kubrick’s film. But just as its stirring vagueness allows for the possibility of a less-than-happy ending, there’s at least a glimmer of optimism in the finale of Planet Of The Apes, which leaves the enraged Taylor next to his mute but improbably glamorous female companion. Who better to rebuild the human race than one who’s seen it make so many mistakes? That wasn’t to be in the Apes sequels that followed, and in 1984, at the tail end of the Laser Age, 2001 got a sequel of its own that supplied some disappointingly mundane answers to the interstellar questions raised in the original. But all that lay ahead in 1968. In the years that followed, many films looked to Planet Of The Apes and 2001 for inspiration as they turned to the future as a way to talk about the present. HAL had many immediate successors in the form of dangerous computers and other bits of malicious hardware, but the spirit of 2001 was felt most strongly in the following decade, through a diverse batch of films that borrowed its immersive approach to create whole galaxies, its grasp of science to create a grounded vision of the future, and its questioning spirit (though seldom all at once). 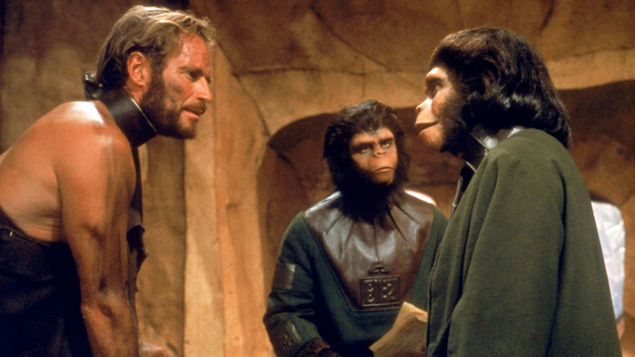 The influence of the Apes films, however, dominated the science-fiction films of the early 1970s, which were filled with grim visions of an Earth in crisis, and maybe even on its way out. The 1968 films helped inspire others to work on a canvas as big as space, and one often just as dark. Next: The Earth Died Screaming: The Omega Man, Glen And Randa, Beneath The Planet Of The Apes, and other early-’70s apocalypses.